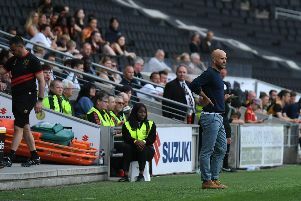 Paul Tisdale felt his side should have seen out the game with a 2-1 lead with 10 minutes to go against Stevenage, but was left disappointed by how his side crumbled to a 3-2 defeat. Goals from Rhys Healey and Kieran Agard cancelled out Steve Seddon's opener as Dons were ahead in the closing stages. But Scott Cuthbert's 84th minute equaliser then led to Ben Kennedy's wonderful 89th minute free kick winner resigned Dons to just their second defeat in League 2 this season, missing out on their chance to go three points clear at the top of the table. “With 10 minutes to go, being a goal up, it was a good place to be, but we didn't finish it off,” said Tisdale. “I'm really disappointed with that, but it was a good experience, we'll learn from it. But at the moment it's not a lesson we want to learn. I would have hoped we'd see that off. There are things we could have done to alleviate the pressure a little. “It was a really good game but nothing we didn't expect. You always get a similar type of challenge here. We got ourselves into a really good position with 20 minutes to go but we let it slip. They were committed to their performance, and they gave us a real challenge but we let it slip in what was a really good game of football. While Kennedy's free kick at the death was a sublime finish, it was the build-up to the free kick which frustrated Tisdale. He said: “I've spoken about the final goal with the players more than the others. The execution of the free kick was great, but what led to that is for me to discuss with the team. “There was a period of time leading up to the goal that I wasn't happy with, but if we're going to do well this season there will be all sorts of challenges, and today was one of those we just couldn't see off.